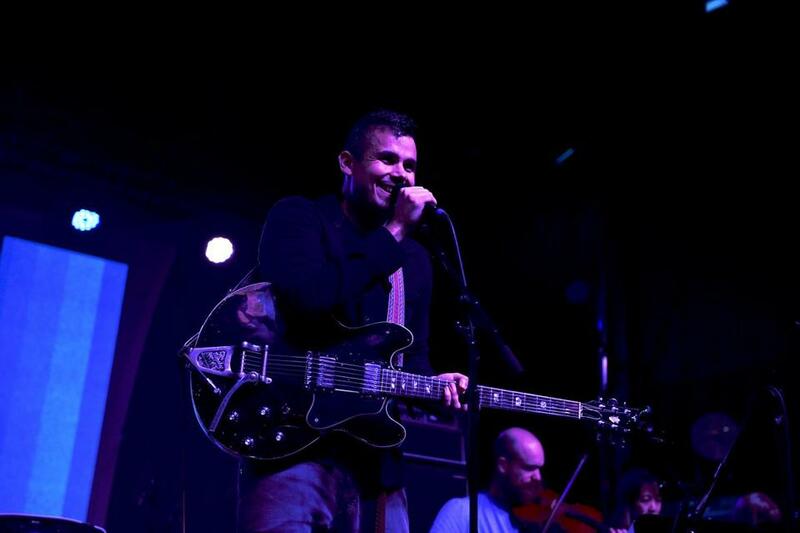 Rostam played a festival in San Pedro, Calif., in October. When Rostam Batmanglij visits a new museum, there’s no particular art toward which he gravitates. That wide-eyed, open-eared way of life infuses the Iranian-American multi-instrumentalist and producer’s whole body of work. It beat through the albums he put out as a member of erudite indie songsmiths Vampire Weekend. It shines in his work with the sweet, sleek art-pop of artists including Carly Rae Jepsen and Charli XCX and the futuro-R&B of Solange and Frank Ocean. And it adds layers upon layers of idiosyncratic musical fascination to “Half-Light,” his debut solo LP, released under his first name. The album, full of vibrant paeans to queer love and life, was recorded and self-produced in Rostam’s home studio in Los Angeles, where he moved after spending a decade in New York. But he says he’s about to be a “resident of nowhere” as he embarks on tour, which includes a sold-out stop at the Museum of Fine Arts Saturday. “I feel like I’m about to enter another phase of my life. I don’t know exactly where I’m going to be,” he says. One stop for him in the near future: Provincetown. Q. What’s drawing you to Provincetown? A. I’ve spent about a week or two there for the last four years, and I really like it there. I think it’s a very special place. It’s one of the oldest gay towns in America, and one of the most naturally beautiful places that I’ve been to in America. So I feel very at home there. Q. “Half-Light” takes a lot of influence from folk traditions around the world. There’s a tabla on “Wood,” and I heard “Sumer is icumen in,” a medieval English folk song. Then I heard the Welsh lullaby “Suo Gan” and “Simple Gifts,” on [the song] “Gwan.” What spoke to you about that kind of music, that you wanted to roll it into your album? A. I guess on some level I find those melodies to be really deep melodies. I grew up going to a school where those melodies were a big part of the curriculum, and I was also exposed to every kind of music at home, including music from around the world and music from the Middle East. On some level that music is in my blood. I think the way that Middle Eastern music and Western music are connected, I think there’s some room to explore those connections musically. I wanted to find those connections between all those folk traditions that I grew up with. It dates back to my childhood being exposed to it a lot, and also something that I experienced in college when I had this realization that all music is about connecting to tradition. Even trap music is a tradition. There’s a reason that the bass sounds the way it does, that the hi-hat sounds the way it does, and the rhythms make that music identifiable. That realization sort of shaped my whole ethos for making music. I feel aware of history whenever I’m making music. Q. Thinking about your albums, and the work that you’ve done with Carly Rae Jepsen, and Charli XCX, have some of the boundaries between so-called pop music and so-called indie music fallen? A. I think there’s a crew of us out there making music; we don’t see songwriting as tied to one specific sound. I think it’s growing wider and wider. I think in the past maybe genre felt more tribal, and I think that now it’s more like one tribe. I think the ’90s was a much more tribal area. Q. What kind of form does a song usually take when you conceive it, and is it always radically different from the studio version? A. Songwriting for me specifically happens one of two ways. One way is to write music and then figure out what to sing on top of it, and the other way it happens is to sit at a piano or with a guitar and kind of coaxing yourself into making up something out of thin air. Just singing the first lyric that falls off the top of your head. I’ll make little voice memos of that and hold onto them, and when I get to a point of feeling excited about something then I’ll kind of pursue recording it properly. Those are the two ways that I go. I guess it’s like the hip-hop model and the traditional songwriting model. @globe.com. Follow her on Twitter @knitandlisten.